Me?? Make something the “Normal” Way?! Bite your tongue! You should know better than that. If there is any way to mess up change a perfectly good recipe, I’m the woman to do it. Hmmm, coming from a food blogger, that doesn’t sound too great now does it? Let me rephrase that to put myself in a much better light shall I? If a recipe has certain inherent flaws or shortcomings, or possibly could be adjusted by adding alternate flavors or adding more layers of flavor, I am the woman who will screw up attempt it and be seen later banging my head off of a table when it fails make a roaring success of it. So were you impressed there?? Huh huh huh? Did I use big words and sound frighteningly wonderful?! Whadda ya mean I just sounded frightening!? I’m hurt! Nay, wounded to my very core! Nay, devastated. Nay, rambling as usual! Living in the south, I kinda love cornbread. If you don’t, they kick you out and make you live somewhere like Siberia (prays I have no readers in Siberia cause I just spent five minutes thinking of places one wouldn’t want to live and then changing them so as to not offend anyone living there 😛 ). You also have to love sweet tea (lack of that love is why they made my native Kentuckian daughter in law move) and Paula Deen (don’t tell anyone, but while I love her recipes, but she annoys the poo out of me with her use of “Y’all” fourteen times in each and every sentence). I wrote a post back when I first started the blog about the differences between Yankee cornbread and Southern cornbread. But this post isn’t about either of them. It’s about MANLY CORNBREAD! Please make sure you say that with a sneer on your face and while swaggering across the room adjusting your crotch. And in reality, I didn’t do much changing to the original recipe. My point was just that I seem to be incapable of making things that are “normal”. Nope; have to hunt down and make the unusual ones. And as cornbread goes, this fits that criteria. It’s from Emeril Lagesse. The only thing I changed was to not use cayenne pepper because while I love spicy foods, I thought that that as well as the jalapenos may be too much for my kids. Plus, I added a good amount more cheese and threw some green onions in there too. I mean… cheese, bacon, peppers… it was just crying out for green onions. Place a 10-inch cast iron skillet in the oven to get hot. Drain all the fat but 2 teaspoons. Return to medium-high heat and add the corn to the pan. Cook, stirring, until golden and tender, about 5 minutes. Add the cream, butter, 1/4 teaspoon salt and water and cook until thick and creamy, about 10 minutes. Do NOT do as I did and walk away and come back just in time to prevent it from overflowing all over your stove top. Ummm… oops? Remove from the heat and mash with a potato masher, spoon, your husbands electric razor… to crush some of the corn. Let cool. In a large bowl, combine the cornmeal, flour, baking powder, baking soda, remaining salt, and cayenne (if using). Stir to combine. In a separate bowl, combine the eggs, buttermilk, and 2 tablespoons of the melted butter. Add the buttermilk mixture to the dry ingredients and mix well. 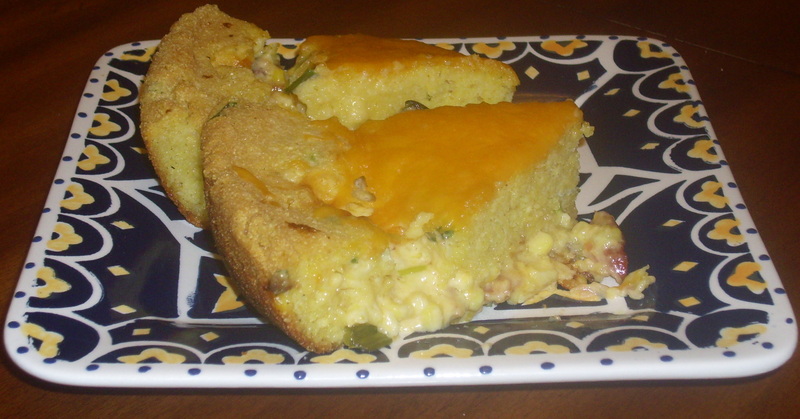 In a separate bowl, combine the cooled creamed corn, bacon, jalapenos, and 1 1/2 cups of the cheese, and mix well.Remove the skillet from the oven and add the remaining tablespoon of melted butter, tilting the skillet to coat the bottom and sides. Pour half of the batter into the bottom of the skillet. Top with the corn-cheese mixture, then top with the remaining half of the batter. Bake until golden brown and set, about 30 minutes.Remove from the oven and sprinkle with the remaining 1/2 cup of cheese. 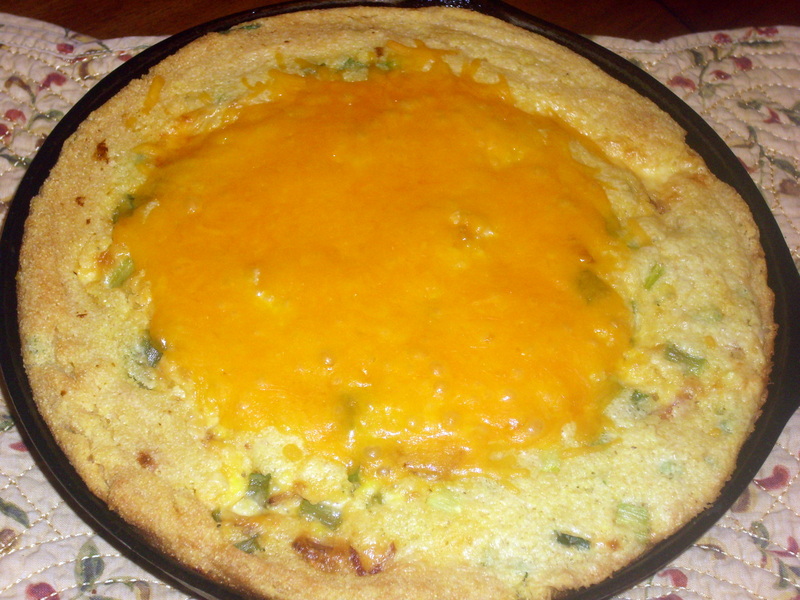 This entry was posted in Bacon, Cheese, Easy, Quick Breads, Side Dishes, Snacks and Appetizers and tagged bacon, cheese, corn bread, quick breads by Janet. Bookmark the permalink. Oh wow, that looks way too good to be true! I normally don’t like cornbread because I find it too dry (same issue with biscuits, scones, etc), but this looks ooey-gooey and delicious! It is Kiri… it is! This WILL get made at our house. Seems like it would make a good thing to divvy up and freeze for a grab-and-go breakfast. Oh, but I don’t drive to work. It would be possible to eat on the train, and I can eat at my desk like I do now. Most of the time, my breakfast is a breakfast cookie from here: http://www.bbcookies.com. Frozen when I leave home and popped in the toaster at work. The corn bread looks incredible! YOU, Kim & me in one blog post….a bit frightening, but WAY COOL! Like the three musketeers….but with kitchen tools! Oh my gosh, you crack me up! You had me rolling with this one! The manly cornbread looks great too! Thanks for a good lookin’ recipe and a very entertaining post! I cannot stop laughing. That was hysterical and unexpected. Just this once I shall be your coke wench but only cuz that was so funny. I’ll bring you one but I draw the line at drinking one myself. Lol. Manly man cornbread….hair on my chest….where do I sign up? This looks fab and I could eat the whole thing. I finally cracked and bought a cast iron pan awhile ago. It is so lovely. I can’t stop using it. Great for cooking and packs a wallop when people annoy me. Lol! Ha-only you could find a way to have cornbread look truly sinful and decadent! Cheesy, bacony…it is calling my name. Wonderful creation –gotta love it. Buzz buzz! Yup. My husband would devour this in one sitting. Time to break out the skillet. Ann, that works for me. Kim has already admitted to beaning people over the head with the cast iron pan (should we be alerting the authorities ya think?) so you and I just have to decide what weapons…I mean, utensils… we want. Kim, you will, you will, you will!!!??? Can I videotape it for proof and spread it all over the internet!!?? Tina, in my warped world, that is a really cool compliment! Heh! I am doing good at corrupting …erhmmm… helping people enjoy the more decadent foods. Yay!! Thanks for the buzz love my friend. Woohoo, Jessica! Let me know how you both like it. Or how he does anyway if all he does is growl and smack your hands if you try to get any. Stuffed cornbread sounds wonderful! Perfect for a big bowl of chili! As if cornbread wasn’t already good on its own, you have made it even more delicious! Janet….I guess being from New England originally….I am used to ‘Yankee’ cornbread….cuz we never had anything like this growing up! This looks outrageously good! (But what ingredient should I leave out to prevent the hair growing on my chest?!? ). Honestly…..I am going to have to get a cast iron skillet this weekend!